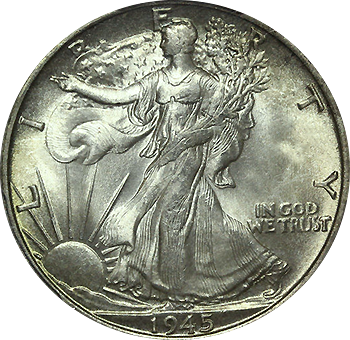 Walking Liberty Half Dollars were issued from the US mint between 1916 and 1947. They are also often called Walkers (not the ones from the Walking Dead), or Standing Liberty Half Dollars. These coins are rarely found in circulation and are 90% silver with a melt value of $5.42. That being said we have found a few when searching half dollar rolls. After the Coinage Act of 1890 gave the US Mint director “permission” to change the design of coins that had been in service 25 years or more, new Mint director Robert W. Woolley decided to update coins the current coins. Thus, in 1915, new designs to replace the Barber coinage (dimes, quarters and half dollars) were commissioned. Adolph A. Weinman won the competition for the half dollar sponsored by the Commission of Fine Arts and, although his design was difficult to implement and never struck well, still became the Walking Liberty Half Dollar which began circulation in 1918 and continued production through 1947 when it was replaced with the Franklin Half Dollar. There were several issues with the original design aside from the strike quality issues. Initial designs showed flaws with the edge and issues with weight and thickness also had to be overcome. The original design by Weinman was modified several times through 1916 and 1917 to accommodate these issues, although the artistic design he conceived remained intact. 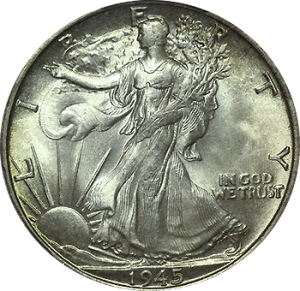 All mints had problems striking the Walking Liberty Half Dollar and, although the dies were modified several times over the course of production, none of the modifications to improve striking were successful. Adhering to government regulations, the Walking Liberty Half Dollar is 90% silver and 10% copper and weighs 12.5 grams. It is 30.61 millimeters in diameter and was minted in San Francisco, Denver and Philadelphia. Even though production of the Walking Liberty Half Dollar exceeded 1.2 billion coins, they have a highly collectable appeal, especially those in Very Fine and Uncirculated condition. Regardless of the availability, the Walking Liberty Half Dollar commands a premium well over silver spot prices for any year and virtually any condition. The exceptions to this are the 1921-D and 1921-S Walking Liberty Half Dollars in VF and U grades which, due to their rarity, have exceptional value. How much is a silver quarter worth? How much is a silver half dollar worth? How much is a silver dime worth? Where Should I Buy Silver?